Tucked into Gov. Tim Pawlenty's $4.2 billion deficit-reduction package is a proposal to freeze the wages of all public employees. The freeze would affect not just state workers, but everyone on the public payroll -- police, county health workers, teachers, and even professors in the state colleges and universities system. Administration officials say the plan is a tool to keep a lid on spending during difficult budget times. But union officials say the plan erodes the collective bargaining process. St. Paul, Minn. — The governor's proposed wage freeze remains a work-in-progress, but it's envisioned to prohibit the state, local governments, or school districts from negotiating new contracts that include wage or salary increases. Pawlenty says the freeze would give public employers a tool to keep spending under control. "Our legislative friends and city friends and county friends are going to have this choice -- they can freeze wages or they can cut some more programs. 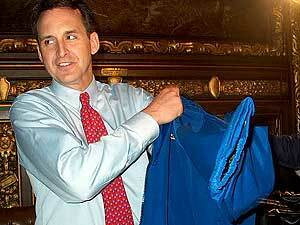 And we think given the choice, freezing wages is a better course," says Pawlenty. "But if they want to dig in and cut more programs -- that's not our priorities, but we'll see if that's their priorities." In the private sector, if ... the company's in hard times, you bargain with your workers. And I don't think the governor ... has made any case, convincing or not, as to why somehow the public sector should be different. The administration acknowledges the freeze won't have a direct impact on the state's projected deficit, since no pay increases were budgeted into the two-year forecast to begin with. Even so, Pawlenty says the freeze becomes a management tool, helping agencies retain more staff and resources rather than pay fewer workers more. But union officials say wage and salary issues are better decided at the bargaining table -- not at the Legislature. Peter Benner is the executive director of the American Federation of State, County, and Municipal Employees, Council 6 -- the state's largest public employees union. Benner says he's skeptical of the Pawlenty wage freeze, which is similar to ideas promoted by the Minnesota Business Partnership and Senate Republicans. Benner says even private companies are forced to the bargaining table when old contracts expire. "That is what you do in the private sector if ... the company's in hard times. You bargain with your workers, with their unions," says Benner. "And I don't think the governor or the Business Partnership or the Senate Republicans have made any case, convincing or not, as to why somehow the public sector should be different." Some public employers, however, are reacting positively to the plan. Charles Kyte is the executive director of the Minnesota Association of School Administrators, which represents the state's superintendents. He says the association hasn't taken a stand on the wage freeze, but he says there are clear advantages to suspending pay increases for the next few years. Our first obligation should be to protect programs for our kids. ... A freeze will help protect these programs. "Our first obligation should be to protect programs for our kids. We need to make sure we're putting our students first," says Kyte. "And we acknowledge that a freeze will help protect these programs, as opposed to having to do massive layoffs when there's no money." Kyte says he's also interested in changing how teacher contracts are negotiated. For example, he would favor binding arbitration for districts and teachers rather than allowing educators to strike. The state teacher union says a wage freeze can amount to a pay cut, because inflation eats into an employee's stagnant earnings. Judy Schaubach, president of Education Minnesota, says teacher compensation is properly negotiated at the bargaining table. She says inadequate pay can also affect the classroom. "If we do things that drive people out, or make college students question whether they should really go into teaching, we're going to create a situation that isn't good for students, either," says Schaubach. "There are always balances that have to be struck, and I think, again, that's best done at the local level." Competitive pay is a concern in at least one other sector. Minnesota has 41 public hospitals that would also fall under the wage freeze. And hospital administrators are worried the freeze would handicap their efforts to hire and retain health care professionals. "We are in the midst of a long-term, severe shortage of health care professionals," says Bruce Rueben, president of the Minnesota Hospital Association. "And the last thing that, I think, anyone intended was that the government-owned hospitals would be put at a disadvantage in terms of being able to retain their health care workers." Legislation mandating the statewide pay freeze has been introduced, but hasn't yet been heard by legislative committees.